A shift is under way that will lead to widespread adoption of EVs in the next decade. With all good technologies, there comes a time when buying the alternative no longer makes sense. Think smartphones in the past decade, color TVs in the 1970s, or even gasoline cars in the early 20th century. Predicting the timing of these shifts is difficult, but when it happens, the whole world changes. It’s looking like the 2020s will be the decade of the electric car. Battery prices fell 35 percent last year and are on a trajectory to make unsubsidized electric vehicles as affordable as their gasoline counterparts in the next six years, according to a new analysis of the electric-vehicle market by Bloomberg New Energy Finance (BNEF). That will be the start of a real mass-market liftoff for electric cars. 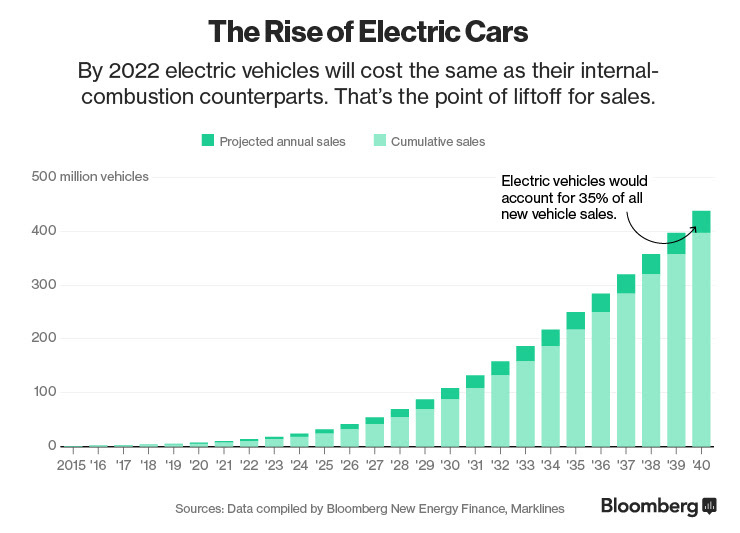 By 2040, long-range electric cars will cost less than $22,000 (in today’s dollars), according to the projections. Thirty-five percent of new cars worldwide will have a plug. First we need an estimate for how quickly sales will grow. Last year EV sales grew by about 60 percent worldwide. That’s an interesting number, because it’s also roughly the annual growth rate that Tesla forecasts for sales through 2020, and it’s the same growth rate that helped the Ford Model T cruise past the horse and buggy in the 1910s. For comparison, solar panels are following a similar curve at around 50 percent growth each year, while LED light-bulb sales are soaring by about 140 percent each year. Predictions like these are tricky at best. 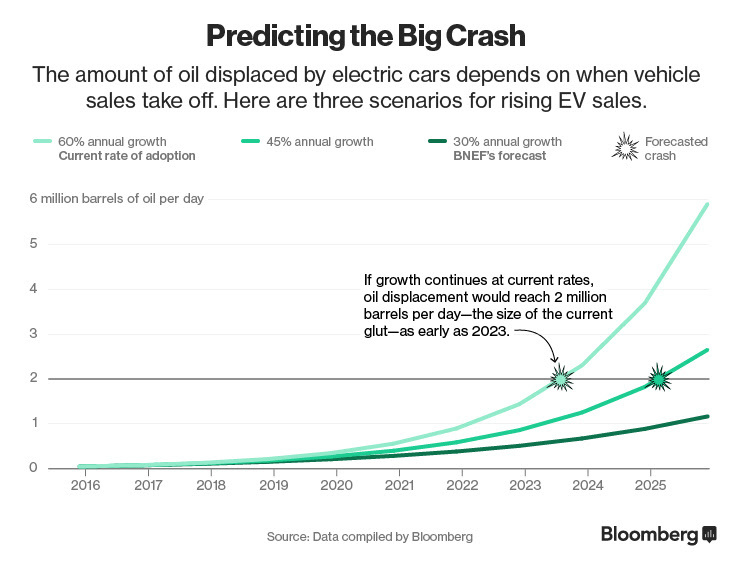 The best one can hope for is to be more accurate than conventional wisdom, which in the oil industry is for little interest in electric cars going forward. 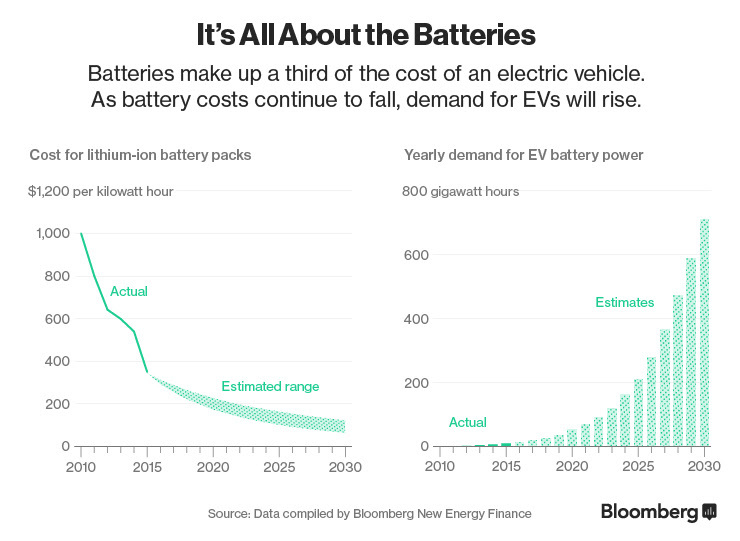 BNEF’s analysis focuses on the total cost of ownership of electric vehicles, including things like maintenance, gasoline costs, and—most important—the cost of batteries. There’s another side to this EV equation: Where will all this electricity come from? By 2040, electric cars will draw 1,900 terawatt-hours of electricity, according to BNEF. That’s equivalent to 10 percent of humanity’s electricity produced last year. The good news is electricity is getting cleaner. Since 2013, the world has been adding more electricity-generating capacity from wind and solar than from coal, natural gas, and oil combined. Electric cars will reduce the cost of battery storage and help store intermittent sun and wind power. In the move toward a cleaner grid, electric vehicles and renewable power create a mutually beneficial circle of demand.